Our largest breeding falcon, and fastest bird, is most likely to be seen circling high above, as it watches for prey to appear. 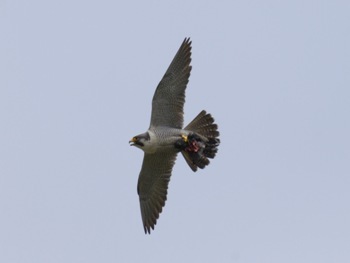 The Peregrine is said to be the fastest bird in the world, when it stoops vertically downwards for its prey it has been recorded at speeds up to 180 miles per hour. With pointed wing tips and short tail it creates a characteristic silhouette and flies with quick shallow wing-beats. It is blue-grey above, with blackish top of the head and an obvious black moustache that contrasts with its white face – giving it a hooded appearance. Usually silent, but may be noisy at the nest with a grating 'scraa, scraa, scraa'.